Why is there more tobacco control policy than alcohol control policy in the UK? Paul Cairney examines their post-war histories to demonstrate ‘paradigm’ policy change in tobacco, but not alcohol, policy. Tobacco control policy is more advanced in key areas, including a ban on advertising and promotion, high taxes to discourage consumption, unequivocal health education and warning labels on products. He argues that a focus on ‘the evidence’ can only partially explain policy change, since the gap between evidence and a proportionate tobacco policy response was 20-30 years. A comparison of tobacco and alcohol policy in the UK demonstrates this point well. Both examples show us the importance of a ‘battle of ideas’ between public health groups and private companies. In tobacco, it looks like that battle has been won (although issues such as e-cigarettes still arise). The scientific evidence, linking both smoking and second-hand smoking to major illness and premature death, has been accepted within government. The evidence is also stated unequivocally, allowing public health groups to argue that there is no safe level of smoking and that a series of measures should be introduced to minimise smoking in the population as a whole. Policy is ‘comprehensive’, involving a range of measures – including a ban on tobacco advertising and promotion, a ban on smoking in public places, high taxes to discourage smoking, unequivocal health education, graphic warning labels on products, and smoking cessation services – designed to reinforce the effect of each other. Policy change has been ‘paradigmatic’, involving a complete shift in the way that governments have understood, and sought to address, the policy problem. Smoking was once a normal or even glamorous activity. Now, it has been ‘denormalised’ by government. To give one sense of that shift, consider that many governments allowed adverts, which implied that smoking was healthy, in the post-war era. Only 50-60 years later, it is portrayed as unhealthy and reckless (particularly when around children). In alcohol, the battle rages on. There is no equivalent to the acceptance of unequivocal evidence within government. Instead, the debate focuses increasingly on the idea that there is a safe (and perhaps even beneficial) level of alcohol consumption. This makes it more difficult to advocate blanket controls (which annoy ‘sensible drinkers’) rather than specific measures (to deal with ‘problem drinkers’). So, alcohol control is relatively ‘weak’ on measures such as advertising and promotion, taxation and health education (although note that the Scottish Government has some responsibility, and it recently legislated to introduce a minimum unit price for alcohol). The industry spends £200million per year on advertising and £600-800million on marketing; while the main avenue for health education is an organisation funded £6million per year by the industry. Drinking is still a normal part of life and government policy does not challenge its normality to the same extent as in tobacco. While this may look like a straightforward case of EBPM – alcohol control is weaker because the evidence is weaker – the history of tobacco control suggests otherwise. If we examine the post-war history of tobacco, we see that the link between the initial production of the scientific evidence (which we now take for granted) and a ‘comprehensive’ government response was 20-30 years. The evidence isnow well established and often taken for granted, but it was ignored by government (or, at least, not acted upon) for a long time. Comprehensive tobacco control may seem inevitable now but, until at least the 1980s, it looked just as unlikely as alcohol control. This is not just an interesting example of EBPM for the academics. It is also a key comparison for public health groups and the alcohol industry, as shown in Figure 1 below. Both groups are looking to learn from the experience of tobacco policy change; to guide their strategies on alcohol. Institutional change. Institutions are the rules and norms that guide policymaking behaviour. Each government department may have its own rules on information gathering (what sources do they seek and which groups do they consult?). 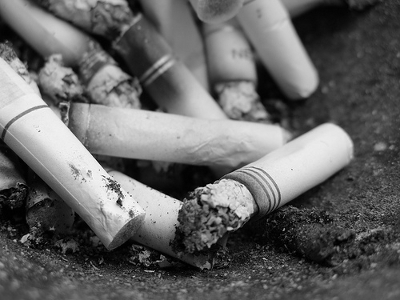 A key change in tobacco is that the Department of Health eventually became the focal point for tobacco action – a change that influenced how the tobacco problem was understood and addressed in government. In alcohol, a range of departments may be involved, including the Home Office (antisocial behaviour, licensing), DCMS (licensing, tourism, leisure), Transport (drink driving) and Treasury and trade departments (these differences between tobacco and alcohol can also be found at the EU level). A shift in attention to, and understanding of, alcohol. Tobacco is now perceived within government to be a public health problem to be solved (rather than an economic product to be encouraged). The need for greater tobacco control also rose up the government agenda at key stages in policy development. The government’s perception of alcohol is more mixed. It may recognise the health element, but be unsure about a general public health approach compared to a focus on problem drinkers (or other groups, such as young drinkers) and anti-social behaviour. It may promote ‘sensible’ drinking rather than abstention. It may also view alcohol as a product with economic value, central to the ‘night time economy’ and linked to measures to encourage the tourism and leisure industry. In contrast, the Treasury finally gave up this economic image in tobacco when it took joint responsibility for policy on health inequalities (and its review in 2002 found that smoking is the primary source of inequality). A shift in the balance of power between participants. In tobacco, the post-war period has been marked by a profound shift within government, from the privileged consultation to the exclusion of the tobacco industry within government (a shift accelerated by the release of internal tobacco companydocuments). Public health groups, once at the periphery of policymaking when directed by economic departments, are now at the centre of policy driven by the health department. In alcohol, the industry still plays a significant part of government strategies (and there is not an alcohol equivalent of the ‘smoking gun’, although groups are now trying to find it). Further, it is responsible for the implementation of voluntary agreements on advertising and health promotion, which give it a reason to be consulted routinely by government (voluntary agreements are generally criticised by public health groups). This relationship with groups is central to the type of evidence a government gathers, its interpretation of the evidence, and the advice it receives. A shift in the socioeconomic context. In tobacco, we witnessed a steady post-war fall in smoking (from 65-82% men/ 41% women in 1948 to 21%/ 19% in 2011); the tax revenue from tobacco (from 15% of government revenue in 1950 to 3-4% now) and public opposition to control (which also tends to fall further after controls have been introduced). All three factors produced an environment more conducive to policy change. In alcohol, the economic benefit of alcohol consumption (or, the importance of the tax revenue to the Treasury), the number of drinkers, and opposition to alcohol control may still be a factor (although recent polls highlight a fine balance of support/ opposition for a minimum unit price of alcohol). The resolution of the battle of ideas. The scientific evidence linking smoking and passive smoking to ill health is now ‘set in stone’ in government. The evidence is not questioned in the way that it once was. Instead, governments have shifted their attention to the evidence on ‘what works’ to reduce smoking (see for example the ‘Tobacco Control Scale’ topped by the UK). This took some time: the scientific evidence on smoking developed from the 1950s but major tobacco control did not emerge until the 1980s; the evidence on passive smoking emerged from the 1980s but a ‘smoking ban’ was introduced in the mid-2000s. In alcohol, there is still debate about the safe/ beneficial level of consumption and the extent to which governments should encourage harm reduction rather than abstention. There may also be a considerable gap between the acceptance of new evidence in government and a proportionate government response – particularly since the industry plays a role in interpretation in a way long rejected in tobacco. 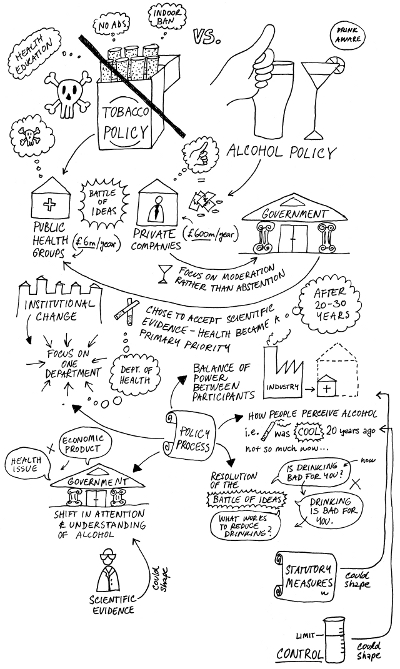 The tobacco experience suggests that changes in these factors are mutually reinforcing; major policy change is the result of the complex interplay between all of these processes For example, an increased acceptance of the unequivocal alcohol-is-harmful scientific evidence would help shift the way that governments ‘frame’ or understand the alcohol policy problem. The framing of alcohol as a public health problem would allow the health department to take the policy lead and consult primarily with public health groups. Alcohol control and alcohol use may also go hand in hand: a decrease in drinking rates reduces the barriers to alcohol control; more alcohol control means fewer drinkers (or less drinking). The replacement of voluntary alcohols with statutory measures would reduce the routine involvement of the industry in government. It is tempting to think that policy change is more likely under Labour and less likely under the Conservatives – and there is some evidence to back up this argument. For example, the Labour Government in 1997 made a much stronger commitment to tobacco control than its Conservative predecessor. Some tobacco (plain packaging) and alcohol (MUP) controls also seem to have stalled after the election of a Conservative-led government. However, a focus on the post-war history also shows us that these long term processes develop during the terms of both parties, and policy change is not reversed after a change in government. In other words, tobacco and alcohol control has a cumulative effect beyond the terms of parties. Overall, the post-war experience of tobacco control provides some positive and negative lessons for public health groups seeking to strengthen the regulation of alcohol (and vice versa for the industry and critics of the ‘nanny state’). On the one hand, it shows us that policy environments which once seemed resistant to public health solutions at one point in time have become conducive in another. The obstacles to contemporary alcohol control resemble those in tobacco before policy began to change profoundly from the 1980s. On the other hand, major policy change, of the level we have witnessed in tobacco, took several decades. The evidence plays a key part in that process, but ‘comprehensive’ policy change is neither quick nor inevitable. This article is based on a longer paper, How and Why are Public Health Ideas Accepted by Policymakers? Comparing Tobacco and Alcohol Control. This was originally posted on the LSE’s British Politics and Policy blog. Paul Cairney is Professor of Politics and Public Policy at the University of Stirling. He does comparative public policy, including the study of single issues across the globe (tobacco control), multiple issues (including health, education and local government) in Scottish and UK politics, and the comparison of policy theories. He tweets @cairneypaul and his blog is at http://paulcairney.blogspot.co.uk/.